This girl is exploring what it's like to paint without using one's hands. 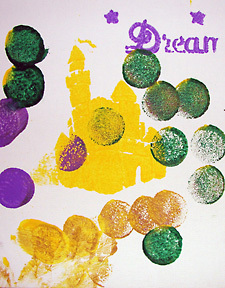 "Dream" was created by Erin using stamps and paint. 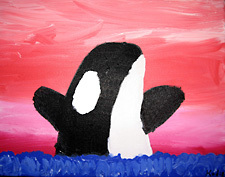 Kodie painted "Orca Sunset" using acrylic paints. The colorful "Bye-Bye Bus" is by Constantine. Every child deserves a voice. For many, art is a preferred form of communication. 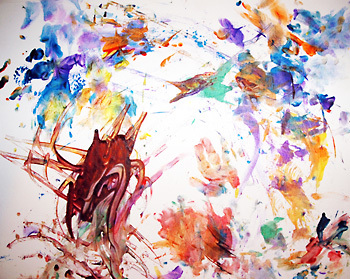 For some nonverbal children, art may be their only form of creative expression. 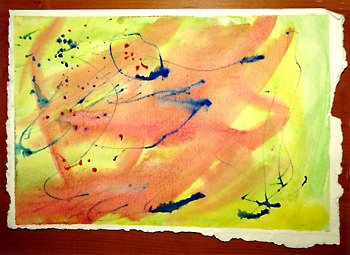 The mission of Angel Boy Art, Inc. is to explore the myriad of ways art can benefit children with special differences. Programs offered to meet the needs of these children include: The Art Fairy Program, Free Online Galleries, Free In-Home Art Therapy, Free In-Home Counseling, and Group Projects. Angel Boy Art also runs special projects aimed at engaging the community, and hosts "Thursday Night Talks" to provide the community with an opportunity to hear various specialists speak about issues regarding children with special differences. Angel Boy Art's in-home therapy program provides individually designed art projects for each child that incorporate physical, emotional, cognitive, and social goals. 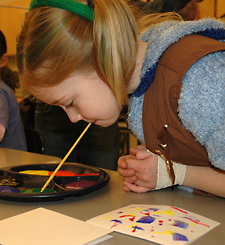 The Art Fairy Program provides free adaptive art supplies, ensuring there is truly no cost to participating children. Children can choose to sell their artwork in the Angel Boy Art online gallery or in its Resource Center gallery. Children and their parents set a basic price for the art, and a small amount is added to that figure to cover the cost of supplies used in making the artwork. Every penny of the child's set price goes directly to the child. Each artist is raising money for things they need such as a wheelchair van, equine therapy, camp tuition, and so on. One child inspired Angel Boy Art. My son, Louie Jr., was born in 2005 with a severe central nervous system disorder. He has used a wheelchair since age three, has had a tracheotomy tube and a feeding tube since infancy, and has had arthrogryposis in all his joints since birth. In 2006, Louie Jr. started physical therapy. Unfortunately, he hated the stretching. As an artist with a creative imagination, I was inspired one day to strap paint brushes to his hands and feet so he was painting as he was stretching. Louie loved it! · Other kids with special differences could benefit from the techniques Louie was helping to pioneer. · Louie's art was more than a distraction -- it became an expression as he began choosing his own colors and brushes, and later it was obviously a form of communication. 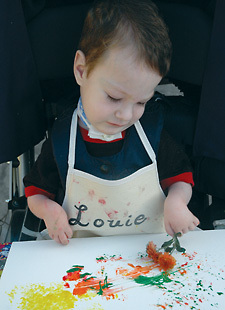 · Louie's art was providing a platform for his big brother, Kane, to interact with him in a way that did not highlight Louie's physical limitations. For the first time they were simply playing together as brothers ... and it was beautiful. Our family wanted to share what we were learning, so in June of 2006 we founded Angel Boy Art, Inc. to bring art therapy to other kids with special differences. In July, we opened the first online gallery with a few paintings by Louie Jr. and Kane. Within a year, the online gallery was hosting over 100 artists! In 2009, Angel Boy Art was named by Easter Seals as "an excellent resource for children with special needs." As the program continued to grow, the goal of one day opening a Resource Center and gallery in downtown Brattleboro came into view. At last, on the first day of Spring this year, Angel Boy Art opened its doors at 61 Main Street. The Angel Boy Art resource center offers art projects and special supplies, books, educational programs, and friendly faces. The gallery features art by children with special differences as well as work donated by professional artists, including limited-edition prints and photography. Some pieces are framed. The gallery also offers vintage, modern, and handmade jewelry, as well as jewelry cleaning and custom orders. Fans of the TV show "Extreme Makeover: Home Edition" may remember that Angel Boy Art was featured twice; as a result, the gallery has several paintings signed by the cast, including host Ty Pennington. Artwork ranges in price from $10 to $500. We encourage everyone to stop in for a warm welcome at Angel Boy Art, 61 Main Street, during Gallery Walk. Hours are otherwise Thursday through Monday 10 to 6; we're closed on Tuesday and Wednesday. For further information call (802) 246-7603 or email support@angelboyart.org. Visit online anytime at www.angelboyart.org.